Before we know it, it will be Thanksgiving and not long after that, the Christmas Holiday season will be upon us. While our dessert dreams invariably turn to pumpkin pie - who doesn't love a slice of homemade pie with whipped cream - why not consider some other classics for this festive time of year. 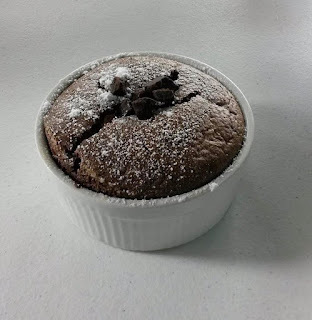 While there are many seasonal favorites, let me suggest a different dessert that is perfect for smaller get-together's - chocolate soufflé. Served with a glass of champagne, this is a great alternative to many of the more common desserts featured during this time of the years. Procedure: (can be used in up to 4 individual molds or one standard size soufflé mold). 1. Bring milk to boil. Mix heavy cream and flour to a paste. Add to milk. Cook until thickened. Add cocoa, coffee, rum and coarsely chopped dark chocolate. Mix well. Add yolks. Cool. 2. Light brush soufflé molds with butter. Dust with some cocoa powder. 3. Beat egg whites and gradually add sugar. Beat to a soft peak. Fold into base. Place in molds. Drop a few pieces of cubed chocolate into each soufflé mold. 4. Bake for 12-15 minutes. 5. Sprinkle with powdered sugar and serve immediately with a glass of champagne.